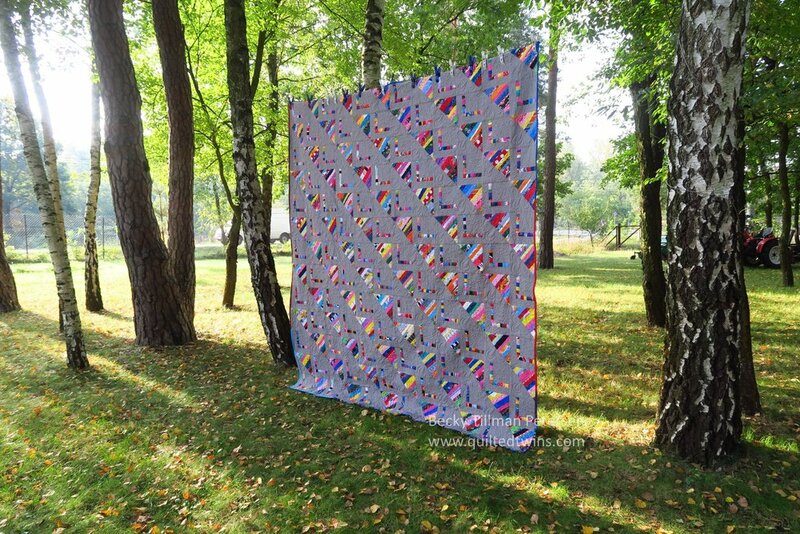 I must be the poster child of how not to quilt! I realize that they say that quilting should be evenly spread on the whole quilt, but when I sat down to quilt this one, somehow I didn’t want to. I tried to make some double feathers in the gray half square triangles, wavy lines in the strings part and close stippling in the part that surrounded the L. The L was just stitched in the ditch around it. Well, those grey half square triangles told me, “Just make something pretty here”. The part of the blocks with the “L” design said, “Make the colorful part puff out if you can,“ and the colorful part of the HST - the strings part said, “No matter what you do here, no one will notice it since the colors are so wild - keep it simple!” So that is what I did. This is one of the strings quilts I worked on piecing over the course of several weekends. Because of that, I showed how I made each block when I made them - at least one time. Here is a close up of the quilting in darkness. 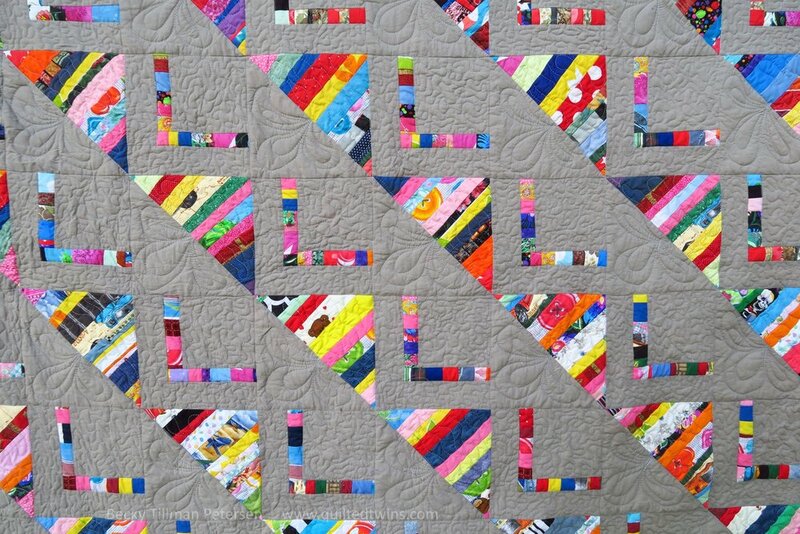 Maybe you can see the quilting even better! I decided on using gray as the solid because I have a lot of it. Plus I had other things to use my white with. I had just finished one with white so I needed a change. 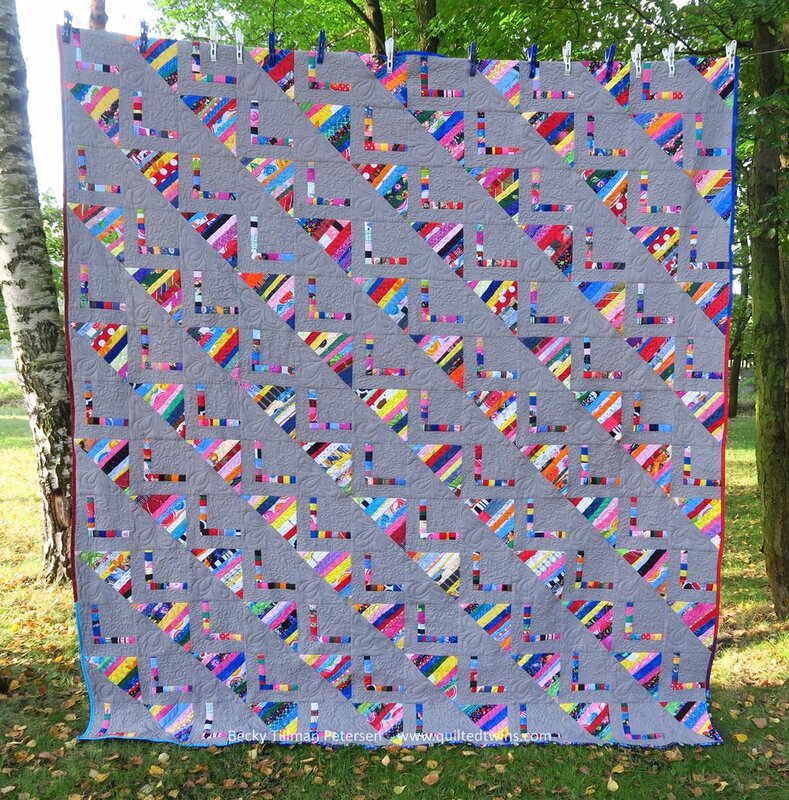 Because this quilt uses two different blocks and the one that uses the most strings is a half square triangle, it goes together pretty quickly. I think it merges the idea of strings with a more modern flair. I say that, but I don’t profess to be a modern quilter. Maybe I should reword that - a more “contemporary” flair! My goal was to make the “L” or the “chair” kind of puff out by leaving it un-quilted and making the quilting around it almost a micro stippling. I was feeling pretty crazy when I decided on that! Lastly, I have to show you a distance shot. it isn’t as impressive from a long ways, however, because there is so much gray. This one needs to be seen up close to be appreciated! I did update the picture over on the crumbs/strings page. I put the pattern on the free patterns page here. And now you know one of the things I’ve been working on lately! Be sure to check out what my sis has for you over in the store! She’s working hard to keep you in fabric at prices you can afford!